The Real GDP Growth rate is the rate of growth of the value of all final goods and services produced within a economy in a given year. Due to inflation, GDP increases and does not actually reflect the true growth in an economy. The GDP is adjusted for price changes to get the growth of the real GDP. The world's top 5 fastest growing economies in 2017 are : Libya, Ethiopia, Macao SAR, Ghana and Guinea. 14 countries have been estimated to grown over 7 % in 2017 where as 14 has growth between 6-7 %. 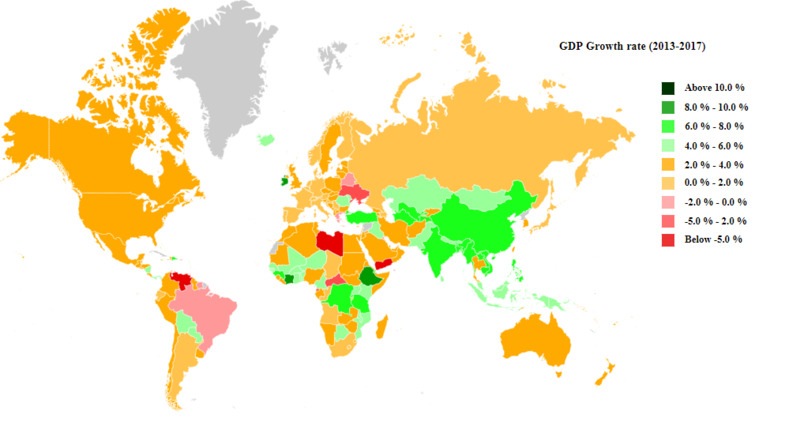 19 have negative growth rate as top 5 lowest are Venezuela, Yemen, South Sudan, Dominica and Timor-Leste. 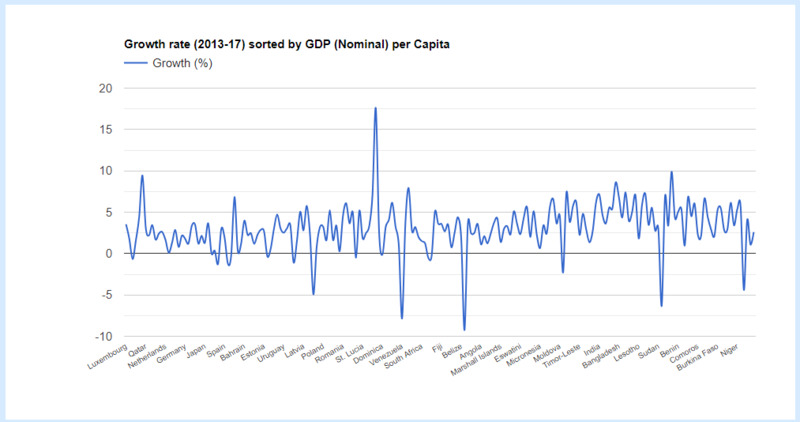 Nauru has highest average growth rate of 17.58% in past 5 year. Oceanian country is alone which has grown over 10 per cent in this period. Ethiopia is 2nd fastest followed by Ireland, Côte d'Ivoire having avg growth over 8%. Emerging economies India and China are at 9th and 10th position, respectively. Among top 10 fastest growing nations, 6 are located in Asia continent, 2 in Africa and one each in Europe and Oceania. Asian and African economies have better figures than others as 45 (23-Africa, 22-Asia) have growth over 4% out of total 99 (55-Africa, 44-Asia). Out of rest 94 economies, only 15 have crossed 4% mark. 16 economies have shown negative growth rate between 2013 to 2017. Libya is at bottom in this list. Other notable economies having negative number are : Venezuela, Ukraine, Brunei Darussalam, Macao SAR, Greece and Kuwait. Generally countries having higher Per capita income has lower growth rate (depicted in the chart). Out of 60 economies that have expanded over 4 % in last 5 year, only 4 are in list of top 50 richest economies, they are : Ireland, Malta, St. Kitts and Nevis, and Iceland. This is the reason why Asian and African economies have better growth rate than rest of the world.